Such detailed & amazing photo, Sara, esp against the dark backdrop! Great shot. That contrast between the white city and the dark grey sky. I love it. Great that you photographed this disappearing Seattle skyline. The dark sky looks dramatic. 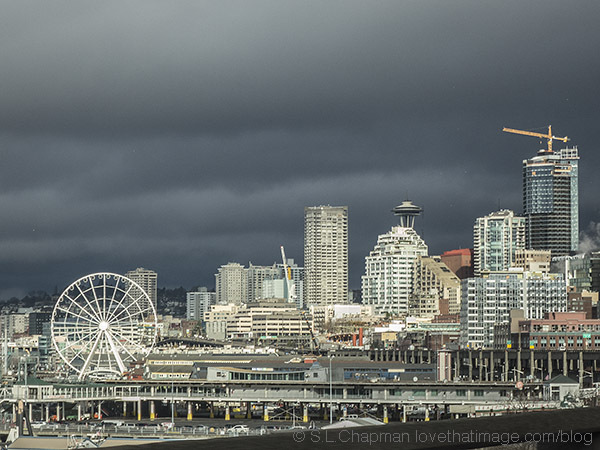 Great shot of those impressive dark clouds over the light skyline. What a stunning photograph. Something to remember after it all changes. Wow, why are they being pulled down? KB, the city of Seattle decided to build a tunnel to replace the Viaduct. Its pier supports cannot withstand a big earthquake, and we are due for one. We will miss those scenic views of Puget Sound from it.